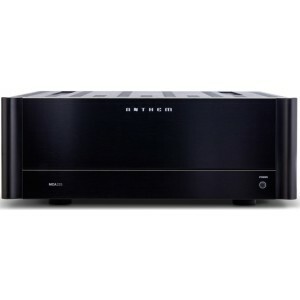 Anthem MCA 225 is a 2-channel power amplifier utilising 225 watts per channel continuous power into 8 ohms, engineered for reliability and optimum sound quality. Earn 1995 loyalty points when you order this item. Anthem’s MCA 225 Power Amplifier is the distillation of endless hours of fundamental research and over 15 years of concentration. Designed, engineered and manufactured in Canada, the MCA range focuses on a single goal: Leadership through innovation and technology. The new MCA series greatly reduces the use of internal cabling for a much smoother circuit path for pure, unobstructed audio performance. The use of low-flux toroidal transformers and improved input transistors provide a greater sense of transparency, even with dynamically complex material. We’ve also improved other performance benchmarks including power bandwidth and slew rate. With a signal-to-noise ratio of 120 dB, background noise is practically non-existent, leaving you with just pure natural sound reproduction. Experience the immense dynamics of up to 600 clean Watts delivered into demanding 2-Ohm loads. Both power supply impedance and internal cabling inductance have been minimized to deliver a clear path for maximum power – even in the most demanding conditions. The result is full bursts of power instantly without affecting channel separation. Exclusive ALM technology monitors internal temperature, current and voltage to ensure safe and uninterrupted long term operation, all the while eliminating the need for internal fuses. ALM™ is not in the signal path, so it never gets in the way. Instead, ALM engages instantly, but only in the most extreme circumstances, to protect your amplifier (and speakers) from damage. This new generation ALM lowers the chance of a line fuse blowing during an over-current condition. Should a fault condition arise, unaffected channels continue to play and all-channel operation resumes automatically once conditions are back to normal. The LED on the front panel confirms status at all times. The new generation of MCA Amplifiers uses of Anthem’s years of experience to “engineer out” common amplifier gremlins. Consequently, we’ve removed output relays, so the signal path has absolutely no moving parts. All parts, including the eight bipolar output transistors per channel, are run conservatively so they remain within their safe operating range. Power-on inrush current has been minimized to reduce line disturbances and stress on internal components. We’ve also upgraded internal connectors and increased mechanical strength. In addition to the reduced inrush current, these new MCA Amplifiers only use between 1-2W in “standby” mode. As with all Anthem amplifiers, they can be switched on manually, via trigger, or by sensing an input signal. New, larger, more conductive audiophile binding posts have been added to maximize contact and maintain a firm grip on the speaker cable. If you’re in the market for cutting-edge audio component separates, Anthem’s new MCA Amplifiers balance the complex dynamics of today’s most demanding multi-channel media with the rare finesse required to satisfy the audiophile in you. MCA Amps provide an abundance of conservatively rated power into demanding low impedance loads, incredible reliability, and a new design aesthetic that matches our sleek AVM 60 Pre-Amplifier. MCA amplifiers deliver incredible dynamics thanks to massive “audiophile approved” conservatively rated power supplies designed with high rail voltages. Low flux toroidal power transformers ensure ultra quiet performance by minimizing stray magnetic field radiation. This provides the pure, clean, low-noise power that is needed to reproduce the full dynamics of home theatre and the most complex and dynamic music recordings. Anthem MCA amplifiers are designed, engineered, and completely Crafted in Canada. We take pride in using only the highest quality components for each one we hand-build. Anthem’s own custom-designed, oversized robust binding posts ensure full power delivery at all times. They’re easy to use and facilitate large speaker cable connectors. Anthem amplifiers are incredibly stable into difficult, low-impedance speaker loads, making these superb-sounding dynamos reliable performers in even the toughest circumstances.